Purchasing a memorial is a unique experience. You are making decisions that will endure for generations. Very often, those decisions must represent the varied wishes and opinions of family members. 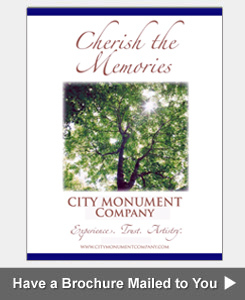 At the City Monument Company in Miami, Florida, our trained professionals can help guide you through the important decisions involved in creating a memorial of everlasting beauty. Determine the requirements and regulations of your cemetery. Many cemeteries have monument size and shape requirements based on the number of graves a family owns. 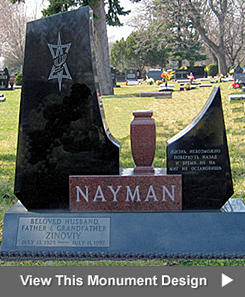 Some cemeteries only allow specific colors of granite, while others require bronze markers. 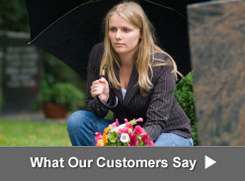 For help finding your cemetery's requirements, please call us at 305-594-4628. The best way to answer these questions is to visit a showroom and let our designers guide you through the process. View your monument in person at our Miami, FL, location or do some virtual browsing in our on-line monument gallery. Depending on style and granite color, your memorial can take from six weeks to six months to be made. Popular granite colors and sizes are often already in inventory, so many memorials can be delivered in 8-12 weeks. We are one of the few monument companies in Miami with our own manufacturing plant, which ensures that your memorial will be of superior quality. We invite you to view a slide show of our manufacturing process or stop by our main office in Miami, Florida. 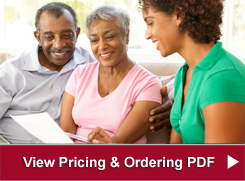 To learn more about ordering a monument, download our "Pricing and Ordering" PDF or call 305-594-4628.